To better serve customers with their onboarding process and build its already technically competent reputation, ACG is pleased to announce the addition of two new key employees. 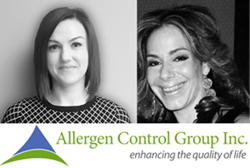 Allergen Control Group Inc. (ACG) is the standard owner of the globally recognized Gluten-Free Certification Program (GFCP), which licenses and works with third-party ISO 17021-1 and ISO 17065 accredited certification bodies; in addition to screening, training and approving food auditors. With a focus on industry food safety programs, ACG continues to take a “deeper-dive” with its global expansion into the “free-from” market. To better serve customers with their onboarding process and build its already technically competent reputation, ACG is pleased to announce the addition of two new key employees. Jessica Burke joins the business as Manager of Compliance and Technical Services, with responsibilities to support the growing GFCP customer base, for all things technical. “To reduce the risk of potential gluten-free product failure, retailers are increasingly mandating the GFCP to their private label suppliers, just like that of their GFSI requirements. I look forward to helping customers successfully achieve and maintain their certification status, with the GFCP,” says Burke. Jessica will sit in the ACG Milton, Ontario office and oversee all training, auditing, accreditation and certification functions. Ms. Burke has an Environmental Technology Diploma from Fanshawe College, which provided her with a strong scientific foundation with its’ robust microbiology and chemistry focus. She brings over 16 years of food industry experience in the implementation, training and certification processes for ISO 17025, SQFI and the BRC Global Food Standards. “Jessica’s well rounded and impeccable work history with major food manufacturers and retailers, will no-doubt be quickly translated into huge value-added service for our existing and rapidly growing customer base,” states Frank Massong, Vice President, Regulatory and Technical Services, at ACG. ACG is also proud to welcome Ms. Mika Varelas to the GFCP team in the capacity of Regional Business Development Manager, reporting directly to the president. Ms. Varelas will be responsible for onboarding new brand owners, manufacturers and retailers into the GFCP, within western USA and Canada. Mika holds a diploma in Undergraduate Studies in Commerce & International Business, from Concordia University and is a Certified Professional in Advanced Food Safety. Fluent in both Canadian official languages and based in Montreal, Ms. Varelas joins ACG with an extensive and diverse background in process improvement, food safety and quality system auditing, cross functional team management and human resources. “I am excited to work closely with Mika and am confident our customers will welcome her knowledge, maturity and overall strong business acumen,” states Paul Valder, ACG president and CEO.